In formal or dressy rooms, curtains should just touch the floor. A romantic room deserves elegant, extra-long curtains that pool or puddle on the floor. Curtains to the sill, or to the bottom of the window trim (called the apron), look great and are practical in a kitchen. Never hang curtains of any length near a stove. Dens or family rooms gain dignity from draw draperies or curtains that reach the floor. Curtains that stop short of the floor, ending at the top of floor moldings, look awkward. 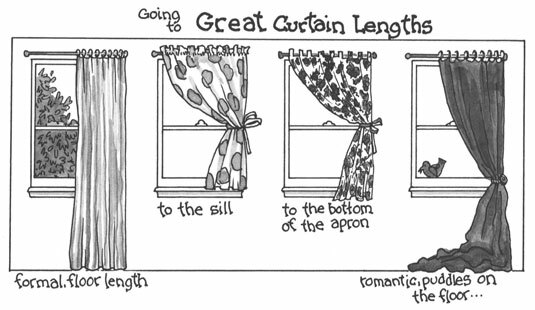 If curtains are hung too high, simply lower them (if possible) to solve the problem. Window too short? Attaching rods just below the ceiling molding and hanging long, to-the-floor curtains make the window look taller and more elegant. Window awkwardly long? Add a deep cornice or valance above draperies with a bold horizontal pattern. Create further distraction by adding a horizontal line in the form of a strongly contrasting louvered shutter. Window too narrow? Extend curtain rods beyond the window and hang open draperies so that they barely cover the frame, leaving as much glass exposed as possible, all of which makes a narrow window seem wider. Window too wide? A huge window wall can overpower a room. Break up the space by hanging several panels across the window. They can hang straight, or be tied back in pairs. If draperies must be drawn for privacy, let the panels hang straight, and rig drawstrings so that the panels close as though they are separate pairs of draperies.